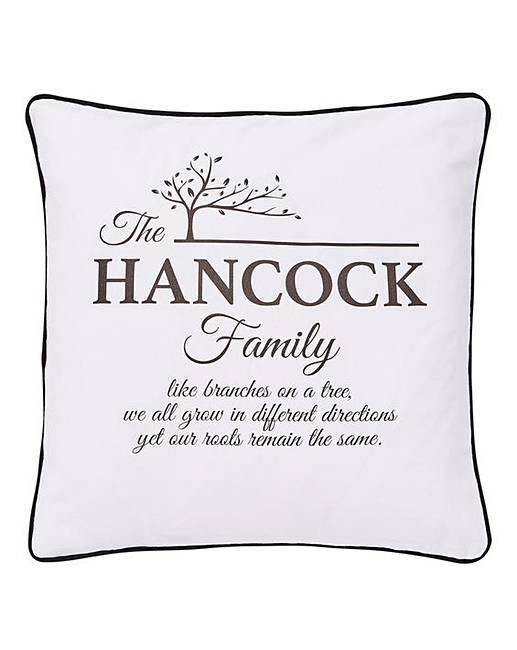 Personalised Family Cushion Cover is rated 4.8 out of 5 by 15. Personalise with a surname up to 15 characters. Rated 5 out of 5 by Parker from Family!! Loved this cushion, bought one each for all the family and friends too. Excellent size and lovely words. Material is soft and cuddly. Rated 5 out of 5 by Rosie from Personalised Bought this for a birthday present and other family members would love one. Rated 5 out of 5 by Naomi1 from Beautifully produced I bought this as a present for my parents. It turned up looking beautiful, the name was correct. I would recommend this for anyone. Rated 5 out of 5 by Owllover from Lovey idea! Really pleased with the quality of this item. I bought one for my son & one for my daughter as Christmas presents and they were really impressed. Rated 5 out of 5 by Tricie from Lovely cushion cover So glad I bought this,just a bit different to give as a gift! Rated 5 out of 5 by Dave from Great buy Bought this as a Christmas present. Very good value and very pleased with it. Recipient loved it. Rated 3 out of 5 by Marnie25 from Family presents Nice covers would have been better if cushion pad inside.